When it comes to safety on the road, it is not worth cutting corners to save a few pennies. AJC EasyCabin ONLY use AL-KO chassis and running gear parts. 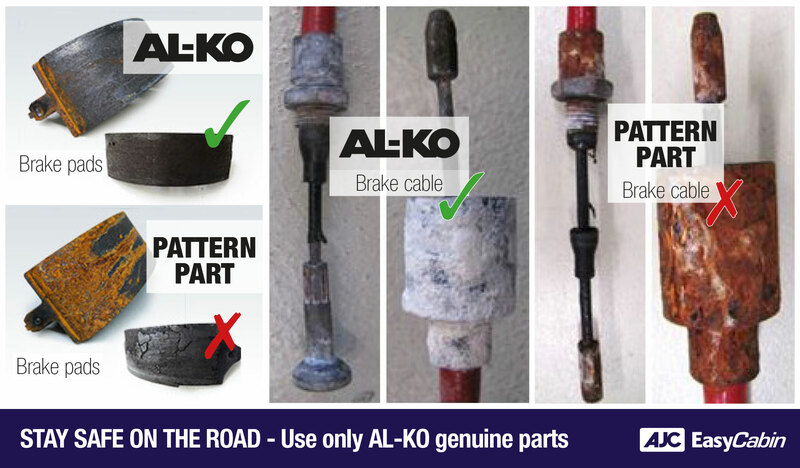 Replacing parts of your trailer running gear with anything not AL-KO is a very big mistake. AL-KO is synonymous with quality and safety all over the world. This is why AL-KO chassis and connection equipment are used by AJC EasyCabin. Our customers also appreciate this high level of quality and safety which is why they have been placing their trust in AL-KO products for many years. This makes the use of genuine spare parts a major aspect to maintain the excellent safety levels of the vehicles. It is a well-known fact that the market is flooded with replica parts from various manufacturers. On the basis of the latest tests and studies of replica brake pads we have established that the use of these products can have fatal consequences. Replica brake pads feature a high content of non-ferrous metal in the pad structure and after a 24 hour salt spray test the pads they were suffering from significant rust formation. In contrast to this, our genuine parts contain no metal whatsoever. In addition, pad surface peeling was found after a few hard braking manoeuvres which can result in a total brake failure. Furthermore, in long-term testing it was found that compared to our genuine parts, all replica brake shoes suffer significantly higher wear and in some cases have smaller braking surface areas, which again has a negative impact on braking force. Summary: These defects have a negative effect on braking force and have a significant influence on road safety. Just to make sure we also tested replica cables and discovered that these counterfeits also suffer major rust formation during the endurance test. Significant chatter can be heard and felt when the cable is pulled. The rubber protective sheath is also extremely brittle. Water can ingress and as a result it will freeze in minus temperatures. Furthermore, the efficiency of the cable deteriorated by more than 10 % compared to a new cable. After several tests and studies we therefore found that replica components can develop serious weaknesses after a very short time. When used continuously their lower quality affects the efficiency and service life. Summary: We therefore strongly advise you to market genuine parts for safety reasons.